There's still hope for the 'pink tide' that swept aside Latin America's right-wing dictators. But in Venezuela, Chavismo is on its last legs. But most of Venezuela's energy is slated for export or is hard to access. Not to worry: Some years ago, the country diversified its electricity supply to rely more on renewables. Hydroelectric power now supplies 60 percent of the country's energy. But not when there's a drought, which the country experienced in 2010 and again even more devastatingly this spring. Thanks to a combination of El Nino and global warming, the dams are dry. The result: widespread power outages. Some Venezuelans are doing well. For instance, black marketeers are making a killing by reselling subsidized goods at higher prices. Political insiders have privileged access to hard currency, which one former government adviser estimates has cost the country $25 billion. Some of the corruption is even uglier. High-level officials -- including the former head of the anti-narcotics agency, the former speaker of the national legislature, various military officers, and two nephews of the first lady -- have been charged with drug trafficking. Virtually everyone else in Venezuela is frantic. The lack of food in supermarkets has created long lines and the prospect of widespread food riots. The crime rate has surged. Government services, once the pride of the government of Maduro's predecessor Hugo Chavez, have practically disappeared, with government offices open only two days a week to save electricity. A huge swath of the population is sinking into poverty as inflation and recession have eliminated the gains made during the Chavez years. The medical system, with shortages of critical drugs, verges on collapse. And these hospitals, they look like -- they look like hell on earth, basically. You're seeing people on gurneys and on the floor in their own blood. One of the hospitals that we went to, there had been a number of newborn infants who had died the day before when there was also a power outage. As if soldiers can defeat global warming and economic mismanagement, he recently put together the largest military exercise in his country's history. His specific recommendations -- for instance, that women should forgo blow dryers to save electricity -- have attracted the ridicule of none other than late-night TV host John Oliver. Unfortunately, Maduro has gotten around these electoral results in a classic autocratic manner by declaring a state of emergency and then expanding and extending this period until at least the end of 2017. The Supreme Court, which Maduro allies in parliament packed with supporters just before they lost control of the legislature in December, nullified the election results in Amazonas state and prevented the opposition from acquiring a sufficient parliamentary majority with which it could, for instance, remove Supreme Court justices. 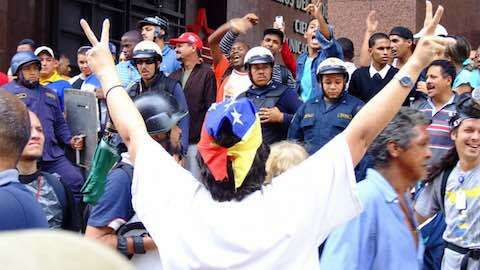 The court has granted Maduro his emergency powers and prevented the opposition from having much influence at all over the country's direction. Meanwhile, street protests continue. But they're not as big as they were a couple years ago. Many people are worried about violence -- dozens died in the 2014 protests -- or are preoccupied with survival issues. Plus, a lot of people have voted with their feet. In the last 15 years, a million people have left Venezuela, and of those remaining, an astounding 30 percent of the population is making preparations to leave. Venezuela's descent into chaos owes much to factors beyond Madura's control, such as the price of oil and the scarcity of rain. But Venezuela, under both Chavez and Maduro, failed to break its dependency on oil for its exports earnings. Chavismo, though it pulled many out of poverty, also constructed an economic patronage system -- or, rather, replaced the old patronage system with a new one -- that guaranteed political loyalty but at the expense of building durable democratic institutions or a sustainable economy. Venezuela could have broken the resource curse -- the convergence between resource wealth and corruption, mismanagement, and gross economic inequity. “Washington is activating measures at the request of Venezuela’s fascist right,” he intoned recently. Washington has indeed applied sanctions against Venezuela, but they focus only on a handful of individuals. The United States also supported a coup against Hugo Chavez back in 2002, and the Obama administration would surely like to see a different team in charge in Caracas. But “Yankee imperialism” is not really a major contributing factor in Venezuela's current crisis. The great irony, of course, is that the Obama administration has expended considerable political capital in pursuing a rapprochement with Cuba, a country that’s had a more implacably hostile relationship with the United States for a much longer period. The U.S. Congress maintains an economic embargo against Cuba even as the two countries reestablish diplomatic relations. The United States and Venezuela enjoy very close economic ties, by contrast, but haven't hosted each other's ambassadors since 2010. A détente has yet to materialize. Even though diplomatic relations between the two countries remain in limbo, business as usual has proceeded. Venezuela has major economic interests in the United States -- including the Citgo refining complex in Lake Charles, Louisiana, and thousands of gas stations. Meanwhile, the United States is Venezuela's largest trading partner, with 500 U.S. companies invested in the country. No doubt Washington would prefer a more pliant partner in Caracas. But with Venezuela one of the top five suppliers of oil to the United States, Washington doesn't want the country to disappear into the black hole of chaos. In other words, the standoff in Venezuela today is not Chile 1973 all over again. It's not the United States that has destabilized the Maduro government. And Maduro is not a noble, idealistic leader, like Salvador Allende, who is trying to take his country in a bold new direction. If you want to see what the United States would look like after a dozen years of Trumpismo, behold Venezuela. So, let's put to rest the notion that the travails of Nicolas Maduro are in any way connected to some retreat of the “pink wave” that swept away decades of authoritarian, right-wing rule in Latin America. Venezuelans are tired of corruption, economic mismanagement, and political repression. Fewer than half of those who self-identify as leftists believe that the country is heading in the right direction, according to a December Pew poll. Venezuelans of all persuasions want a change. In a future column, I'll take a big-picture look at the Latin American left and what's happening in Argentina, Brazil, Chile, and elsewhere. But the turn against Maduro has little to do with any rejection of the left. Maduro is a populist with autocratic tendencies, and the opposition coalition consists of parties across the entire political spectrum, including Radical Cause, the Progressive Movement of Venezuela, Progressive Advance, and several social democratic parties. Hugo Chavez is dead. Chavismo, which was more of a cult than a political ideology, is on its last legs. Before Venezuela succumbs as well, it's time for a radical restart in the land of Bolivar. Latin America: "A Failed State in Latin America?"